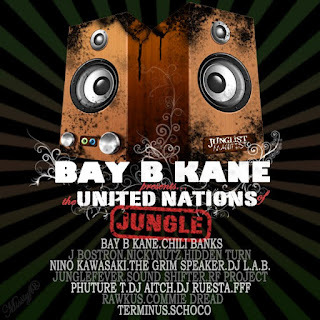 Bay B Kane Presents: The United Nations of Jungle is a collection of 19 Jungle artists from the world over. They all came together with one goal in mind. This was to create tunes that carried the same vibe as the old school tunes of the early 90's. This project was put together by legendary producer and Junglist Manifesto artist Bay B Kane. All of the artists involved used samples from the classic Bay B Kane "Have a Break" sample pack. What emerged is an absolute smashing tear out of an album. It could almost be considered a double album with its booming 19 tracks. Available everywhere Feb. 28, 2012. "I want to say a massive BIGUP! to all the producers who got involved with this project & waited with great patience while we struggled to overcome many obstacles along the way. Thanks to all those who support Jungle around the world but also those who do their best to knock Jungle @ every opportunity Bless you all..This is how we get down!" "Peace" - Bay B Kane. Here is the first single Bay B Kane's VIP Remix of Chili Banks' "London Gash".